Our little embryo measured ahead at 7 weeks, 3 days with a heartbeat of 138. The tech could find no explanation for the spotting. Looks like Little Sears may be in it for the long haul, after all! Whew! So glad to hear that. I'm really excited for you and your family! HOORAY! Im so excited for you. Glad everyone is doing well! Congrats! Yeah I am so glad to hear! I was so worried? Excited? Nosey? I got up to go to the bathroom in the middle of the night and thought I would jump on to see if you had updated. Glad Little Sears is ok! Oh! Yay!!!! I am truly glad to hear this! 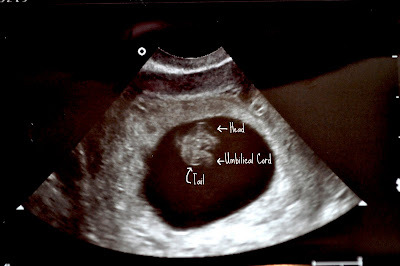 We can't wait to meet you, little one! Hugs to everyone!